The Western Ghats are a 1,600km long mountain chain. They are believed to have been formed during the break-up of the super continent of Gondwana some 150 million years ago, as the faulted edge of the Deccan Plateau. Its rainforests, rivers and grasslands contain a high plant and animal diversity, including rare and endemic species such as Asian Elephant, Gaur and Tiger. This is a serial nomination of 7 different areas that include 39 components in total. 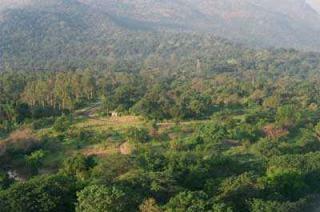 Examples of these components are Periyar Tiger Reserve, Silent Valley National Park and Chinnar Wildlife Sanctuary. We visited to Dhoodsagar (milky falls) in Karnataka Goa boarder of India, In drought like situation also it is raining heavy. Several Big Mountains are not leaving rainy clouds to pass them and Mountains are stopping clouds and raining heavily, we became wet with dress and enjoyed the falls for 2 hrs and enjoyed rain 5 hrs in a day. The Kaas plateau is a wonderful place indeed but protective measures need to be hiked if the area is to be preserved as a natural heritage. I have been visiting the plateau for the past few years and must say the place is paying badly for its increasing popularity. Although the forest department has taken some steps, they are woefully inadeqaute. In 2013, the plateau was besieged by visitors, espeically over the weekends. The long row of vehicles caused traffic jams that led to vehicles staying put in one place for as long as 30 minutes (and i am not exaggerating). People trampled the meadows in their eagerness to take pictures, stepping on flowers to position themselves in the middle of the flowery patches. The Kaas lake and its vicinity, home to some very small but rare plants, is a favorite spot for picnickers; the place is littered with plastic and glass shards. Hoping that the forest department will take stricter measures to limit the number of visitors and ensure better protection of the flowers. As a World Heritage enthusiast, it is a big shame to visit a site that is a World Heritage and does not know it is until a week later! In late October, my colleagues and I had a quick and short business meeting trip in Pune, India. The meetings were not good and end rather quickly. At first we planned to move to Mumbai, so that we could use a free day with a possibility to see two World Heritage sites in that city, but our Indian business partner did not want to pay Mumbai hotel price and persuade us to stay in Pune instead. One of their suggestions was to take us to see the flower valley which sounds quite interesting at least for my colleagues. Next day morning, we were on a van out of Pune, the areas were still green even in the late monsoon season. We saw two lovely waterfalls, and many beautiful green mountains, the view was not a typical Indian at least in my opinion. The landscape with green grassland with cows reminded me of Sri Lanka! About two and a half hour we finally reached a flower valley, the view of area was lovely with many wide violet flowers full of the whole mountain. The location was not a valley at all but the flowers were located on the high plateau called Kaas. My colleagues told me that the view remind them Tuscany with much more untamed landscape, I could not agree more. After that we drove to see a dam and a lake, the area full of grassland and forest, a very pleasant place to visit. After come back for a few days, my Indian business partner sent a mail with some photos of my trip and asked me how the Kaas Plateau and mentioned its World Heritage status! At first I was very confused as I never heard the name of Kaas Plateau on the Indian UNESCO list, then I suspected the Western Ghats since I pretty sure that the mountains between Mumbai and Pune was the famous Western Ghats, so I checked the serial sites list and found Kaas Plateau on one of them! So I really visited a World Heritage Site and not only one serial site but two serial sites actually as the lake, I saw, were located in Koyna Wildlife Sanctuary! I enjoyed a visit but felt very bad to call myself a World Heritage enthusiast. Western ghats is a series of hills, valleys, mountains that form a part of the south western part of India. They form a complex ecosystem conserving water, supporting forests and a rich wildlife. they begin after the city of Pune in Maharashtra alongside the western coast of India and go down till the state of Kerala. During the Indian monsoons, the ghats are transformed into a magical world of waterfalls, pools, mists and lush greenery. Arguably the best time to travel is between June and September when its raining in almost all of India. Take a train from Mumbai (Bombay) and watch the western ghats through the Konkan railways. This train line stretches till Trivandrum and you get to see the ghats in all their glory. You may als drive down but then you would have to watch the road as well, it being India after all!! But its definitely pretty and worth a trip. Thanks to government intervention most of the ghats are protected through national parks and preservation centres hence you can actually enjoy the train journey. Royal Hunting Grounds: Part of Western Ghat WHS is Periyar National Park which was a private game sanctuary by the maharaja of Travancore to stop the encroachment of tea plantations. Founded as Nellikkampatty Game Sanctuary in 1934, it was consolidated as a wildlife sanctuary in 1950 after the political integration of India, and designated as a national park in 1982.